Organize your drawing by assigning objects to layers. When a drawing becomes visually complex, you can hide the objects that you currently do not need to see. Important: Resist the temptation to create everything on one layer. 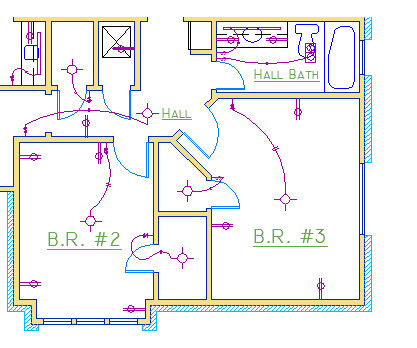 Layers are the most important organizing feature available in AutoCAD drawings. To see how a drawing is organized, use the LAYER command to open the Layer Properties Manager. You can either enter LAYER or LA in the Command window, or you can click the Layer Properties tool on the ribbon. 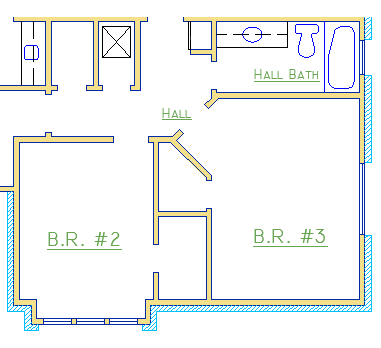 Here's what the Layer Properties Manager displays in this drawing. As indicated, layer 10 WALLS is the current layer. All new objects are automatically placed on that layer. 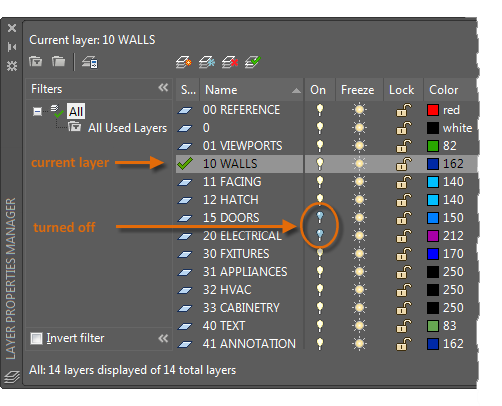 In the list of layers, the green check next to layer 10 WALLS confirms that it is the current layer. In the column labeled On, notice that the light bulb icons for two layers are dark. These layers were turned off to hide the doors and electrical wiring in the floor plan. Notice that each layer name starts with a two-digit number. This convention makes it easy to control the order of the layers because their order does not depend on the alphabet. Tip: For complex drawings, you might want to consider a more elaborate layer naming standard. For example, layer names could begin with 3 digits followed by a naming code that accommodates multiple floors in a building, project numbers, sets of survey and property data, and so on. Layer 0 is the default layer that exists in all drawings and has some esoteric properties. Instead of using this layer, it's best to create your own layers with meaningful names. Any drawing that contains at least one dimension object automatically includes a reserved layer named Defpoints. Create a layer for behind-the-scenes construction geometry, reference geometry, and notes that you usually do not need to see or print. Create a layer for layout viewports. Information about layout viewports is covered in the Layouts topic. Create a layer for all hatches and fills. This lets you to turn them all on or off in one action. The following are the most commonly used layer settings in the Layer Properties Manager. You click the icon to turn the setting on and off. Turn off layers. You turn off layers to reduce the visual complexity of your drawing while you work. Freeze layers. You freeze layers that you do not need to access for a while. Freezing layers is similar to turning them off, but improves performance in very large drawings. Lock layers. You lock layers when you want to prevent accidental changes to the objects on those layers. Also, the objects on locked layers appear faded, which helps reduce the visual complexity of your drawing, but still lets you see the objects faintly. Set default properties. You set the default properties for each layer, including color, linetype, lineweight, and transparency. New objects that you create will use these properties unless you override them. Overriding layer properties is explained later in this topic. To create a new layer, click the button shown and enter the name of the new layer. To make a different layer the current one, click the layer and then click the indicated button. The Layer Properties Manager takes up a lot of space, and you don't always need to access all the options. 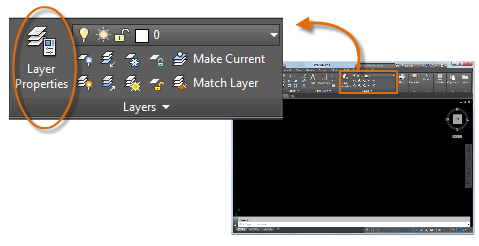 For quick access to the most common layer controls, use the controls on the ribbon. 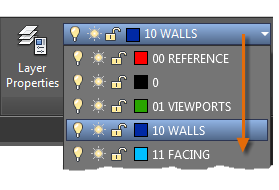 When no objects are selected, the Layers panel on the Home tab displays the name of the current layer as shown here. Occasionally, check to make sure that the objects you create will be on the correct layer. It's easy to forget to do this, but it's also easy to set. Click the drop-down arrow to display a list of layers, and then click a layer on the list to make it the current layer. You can also click on any icon in the list to change its setting. It's critically important either to establish or to conform to a company-wide layer standard. With a layer standard, drawing organization will be more logical, consistent, compatible, and maintainable over time and across departments. Layer standards are essential for team projects. If you create a standard set of layers and save them in a drawing template file, those layers will be available when you start a new drawing, and you can start working immediately. Additional information about drawing template files is presented in the Basics topic. Layers organize your drawing, enabling you to temporarily suppress the display of unneeded graphical data. You can also assign default properties such as color and linetype to each layer. 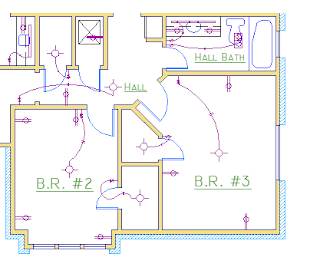 Note: Some experienced AutoCAD users set properties only with layers, while others set properties independently of layers or in combination with layers. Assigning properties to objects is covered in the Properties topic.